Full Disclosure: I am a vegetarian and have been, with tiny blips, for 13 years. I choose to be a vegetarian not because of health…I have taken my fair share of Haagen Dazs and Lays as proof of this. I became a vegetarian because I wanted to avoid harming animals. As my own awareness of the impact of eating animals grew, my choice was strengthened knowing that my vegetarian ways also went a long way towards minimizing my impact on the planet. It is estimated that animal agriculture is the number one cause of climate change – not airplane or car travel – it is eating a breakfast of steak and eggs that seals the planet’s fate. The book is about what it means to eat animals and in today’s industrialized food system that means factory farmed animals. Animals that are “maximized” and “commoditized” as opposed to tended and nurtured. Some who eat animals believe that it is natural for us to do so; however, factory farms, with their crushing conditions and artificial daylight are as far from natural as can be. Even though I am resolute in my own choice to be a vegetarian, as I learn more about our food system I can sincerely appreciate that there is a significant difference between the factory farmed poultry you find at most national supermarket chains and the poultry that you get from Polderside farms (see the article about them in Edible Vancouver here). 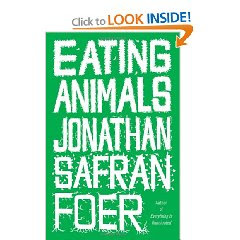 While the choices to eat animals or not is quite personal and both sides of the argument have merit – I share Foer’s conviction that no one can honestly debate the merits of reducing suffering of our food animals. I started this book yesterday and already I am a third of the way through – I am drawn to its message and its fairness so far – this is not a book that demands its readers become vegan. You might think, “Isn’t it a convenient position to support since you are already vegetarian”, but I argue that the book is bringing my own dietary inconsistencies to centre stage once more. If our intent is not to harm animals, we must also think about the way the chickens that lay our eggs and the cows that produce our milk have been raised as well. And for many years I have justified buying conventional eggs and milk because they are half the price of organic and humanely raised products. Yet by giving up a couple of lattes a week I can make up the 6 dollar difference pretty quickly and ensure that the animals that supply my food don’t suffer in the process. So here is my promise, placed on the web for all to see, that I will no longer make that compromise. I encourage you to pick up the book and join the conversation….how will you change the way you eat animals?